For Razr fans wondering if they should dare to be excited or curb their enthusiasm over a dream, there was that recent previous report about a foldable phone in the wings, in a much-quoted story from The Wall Street Journal. WSJ did not go for "subtle" in its header: "Return of the Razr—With a Foldable Screen and $1,500 Price." Staffers Rob Barry and Sarah Krouse said this was "according to people familiar with the matter." The plan according to the "people familiar with the matter" involved current testing; readiness could come as soon as February. Barry and Krouse added, though, that the timing was not yet final and it could change. The much quoted 91mobiles delivered a patent-spotting article which added more interest in the earlier WSJ report of a RAZR revival intent. Reasons vary—conversation piece, status symbol, screen play, small digital workhorse—but the concept of a foldable seems to be an instant crowd-pleaser in 2019. At least we are told that we want a foldable. 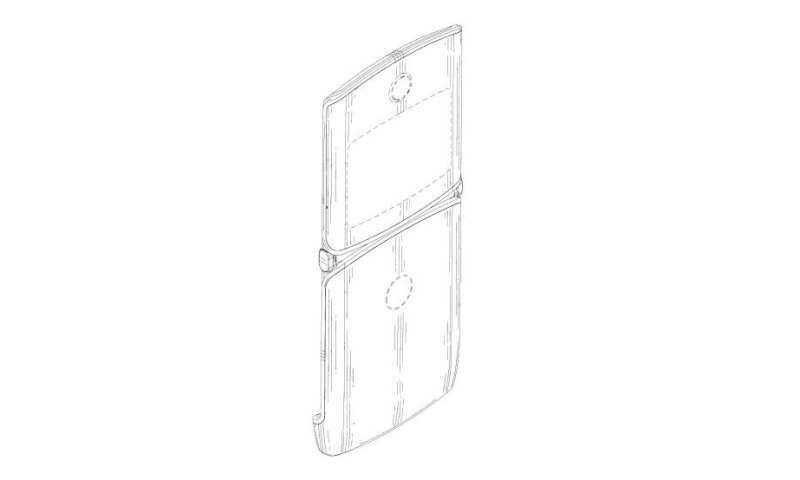 Motorola is possibly going to make foldable fans even weaker in the knees with patent talk. The patent filing is all about a foldable display —and that is, two screens folding vertically. Android Authority's Scott Gordon examined the patent filing's designs to see roles that the two screens could play: "When closed, it appears there may be a relatively compact front-facing screen, perhaps for notifications and at a glance information, while a larger display on the inside will be revealed when unfolded." The World Intellectual Property Organization (WIPO) carried the date of filing as December 17. Motorola Mobility LLC, Chicago, is the company that did the filing. Three designer names on the filing were Joel Soto, Poliana Pereira and Mark Finney. As Vishal Kawadkar in Gizbot pointed out, it is not just an intended gee-whiz feat of folding and bending that is proposed. The smartphone would have users interacting with it in different ways. "Above the secondary display on the foldable Motorola phone will be what appears to be a camera, while the lower half will be home to the fingerprint sensor." That was Ravi Sharma's description on January 21 in 91mobiles . He talked about the housing for the fingerprint sensor and camera. Jacob Siegal in BGR had this to say about the secondary screen, "on the top half of the back panel, similar to the CTSN screen that was featured on the old RAZR V3. There looks to be a camera just below the front-facing display, while a fingerprint sensor adorns the lower half of the back panel." It also means "two apps can be running simultaneously while processing power and interactivity are active," said Kawadkar. Several reports said the illustrations showed resonance in design cues with the earlier clamshell RAZR V3. Ravi Sharma in 91mobiles also thought of the RAZR V3 of old. Nonetheless, Siegal pointed out that even if the look of the new RAZR reminded you of the older RAZR, "the feature set will be more in line with the phones currently on the market." As for the patent idea, Sharma described a "thick chin" and a "tall display." A mike and speakers would reside in the thick chin. A cutout on the top would house the earpiece. It will be interesting to see what if any confirmations arise in the weeks to come. Anyone, meanwhile, brave enough to step forward and ask "why do I even want a foldable?" Stan Schroeder in Mashable is courageous enough to ask if foldables are a dream form factor. He has answers. "Foldable phones are a solution to a problem that doesn't exist, and—from what I've seen so far—a clunky one. They will dominate the headlines next year and perhaps the year after that, and then they'll go the way of 3-D televisions and portable VR, he stated. Schroeder pointed out that "Smartphones have shed the bezels around their displays, making them big enough to watch the occasional video or read a longer article (for books, you want to use an e-book reader anyways), while the phone maintains a manageable form factor." He offered another point: Firing up your laptop may still be more practical than turning to your phone, for doing serious work.